if you haven't made a voluntary donation to view this title. Click on now to do it the safe and easy way via Amazon's Honor System. The suggested contribution is $12, though you may offer as little as $3 or as much as $50. The Declaration of Independence constitutes the proclamation to the world of a deliberate act justified by the mother country's refusal to accept as valid certain "self-evident truths" whose time had come for manifestation in the evolution of mankind. Because of what followed the Declaration and the colonists' victory in the War of Independence, it became clear that a step had to be taken if the new Federation of States allowed by England to function within defined boundaries was to become a viable, self-determined and self-maintaining political organism, a nation among nations. The Articles of Confederation established a legal union of thirteen independent states and gave certain powers to the Congress of the Confederation. But this was government by states, not by "We, the people," and there was no central Executive. A further step in national integration remained to be taken. 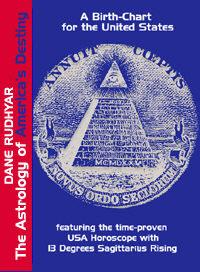 Some astrologers have argued that the moment of New Hampshire's ratification should be considered the moment of birth of the constitutional government which has ever since controlled the development of "these United States." There is some validity in this opinion, but the fact remains that while the Constitution was accepted in principle on June 21, 1788 (Summer Solstice), it was not declared officially in effect until Wednesday, March 4, 1789, at 0 hours and 1 minute A.M. in New York City. (3) March 4 was. the day on which the first session of the newly elected Congress was held, officially beginning the Federal Government of the United States. On April 30, George Washington, who had been chosen unanimously by the electors, took office as President. However, not enough delegates were present for that first session of Congress to constitute a legal quorum, so some astrologers have preferred to use the date of President Washington's inauguration to mark the actual beginning of the Federal Government. According to Thomas Hague, though legally scheduled to occur at noon on April 30, Washington actually took his oath of office at 1:20 P.M. This time gives early Virgo rising and Gemini 1° at the Mid Heaven. The Sun and Venus are in the ninth House and the Moon is coming to a conjunction with Jupiter in the eleventh House.